Pant scored 25 runs to leave India at 127/6. 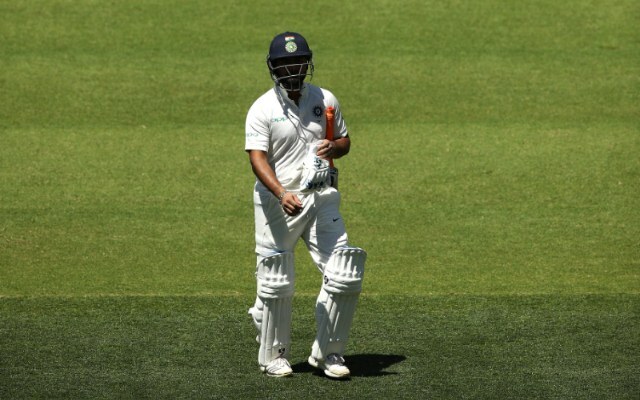 India’s batting so far in the ongoing Adelaide Test could only be described with one word, ‘Harakiri’. With the featherbed of a pitch on offer and after winning the toss, their top-order literally blew away a chance of batting big in the first hour itself. The new cherry moved a wee-bit and it was enough for the openers. The middle-order including Virat Kohli crumbled and then came Rishabh Pant who seriously didn’t have any idea what was going on. The youngster went tried to go after the bowling but he failed to mix caution with aggression. During his brief stay at the crease, he looked like getting out almost off every delivery. Mitchell Starc was all over him bowling those tempting fuller length deliveries. Pat Cummins also did the same even as the left-hander attempted an ugly hoick which left even the commentators surprised. While he raced away to 20 off his first few balls itself, Pant never looked confident in the middle. The partnership of 41 runs took India past the 100-run mark but it was only a matter of time before the wicketkeeper-batsman was dismissed. Rishabh Pant, after getting lucky early on in his innings, was undone by a beautiful drift from Nathan Lyon. The off-spinner is the master of these conditions and the front-foot defence from Pant led to the ball taking his bat’s faintest of edges. Tim Paine comfortably pouched the catch and Pant’s ‘IPL’-style innings came to an end of 25 off 38 balls. Things aren’t looking good for the visitors after the second session as they are 143/6 after 56 overs with Pujara alone fighting it out with a proper Test knock. He has scored 46 runs off 141 deliveries with four fours as Ravi Ashwin is supporting him. The duo has added 16 runs together for the seventh wicket stand and it will take a lot from the to pull India out of the hole they have dug for themselves. Meanwhile, Twitterati was not at all impressed with Rishabh Pant who batted in T20 mode and thrashed him for his approach. Just as he is about to go out to bat, someone must whisper into Pant’s ear “Test cricket, not IPL”.